During Lent many take it upon themselves to take a step back and review their lives. Some choose to follow a strict diet forgoing meat, dairy, eggs, alcohol, sweets, and the like. If you’re one who prefers to follow a strict Lenten diet, you might want to try this recipe which offers a unique blend of flavors. 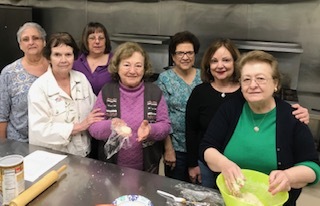 The Women’s Guild of St. Sarkis Armenian Church inCharlotte, NC reserved one day to gather in the church’s kitchen and prepare a Lenten recipe not known to many – Peanut Butter Kufteh. Since I’d posted this recipe a while back, I was asked to ‘lead’ the project, meaning I would gather the ingredients, and share the recipe. Easily done. Once the ladies arrived, sleeves were rolled up and work was begun. We had lots of fun while learning from each other in the process! 1. 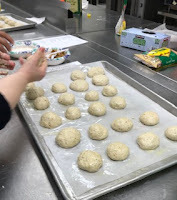 Mix together the bulgur, oatmeal, farina, flour, salt, mint, basil, cayenne, and black pepper; add most of the hot water, stirring to create a dough. Knead. If mixture is too dry, add a little more hot water. If mixture becomes too wet, add a bit more flour or farina. The dough should not be too sticky. 3. Fill the shell with one tablespoon or more of the filling. Seal the top and smooth with wet hands. (Keep a bowl of water handy to dip your hands to ease this process.) Shape the kufteh so that it’s flat on the bottom and slightly rounded on the top. If that’s too hard to master, keep the shape round. To make the shell as thin as possible, we lined a small plate with plastic wrap, took a golf ball sized piece of the 'dough', flattened it into a circle by hand, then gently lifted it off the plastic - while trying not to break it. You really do have to keep a small bowl of water to dip your hands into for this process. The water helps 'glue' the outer shell together. After placing a spoonful of filling in the center, gently encase the filling with the outer shell. Finally, smooth the surface with wet fingers, making sure the kufteh is flat on the bottom and slightly rounded on the top. If you prefer, after the kuftehs are boiled, place them on a paper towel-lined tray and pat dry. Lightly oil the tops of each kufteh. Bake in a preheated 350°F oven for a few minutes or until the tops are lightly browned. To freeze the kufteh: After kufteh is boiled, cool completely. Wrap individually in plastic wrap to prevent them from sticking together, and store them in a freezer storage bag. To defrost and reheat: Defrost in the refrigerator overnight. Boil some lightly salted water; reduce to a gentle boil. Add kufteh without crowding, and heat for about 5 minutes. Or, follow the instructions above for heating in the oven. Using a garlic press, crush the garlic cloves. Place on a plate and mash with salt create a paste. Add the mashed garlic, tahini paste and ¼ cup of lime juice to the bowl of a food processor and blend until smooth. Add a little bit of water and blend again. Taste to see if you need to add more lime juice. If the consistency is thicker than you’d like, add more water until you reach the desired consistency. NOTE: Tahini sauce will thicken as it emulsifies. Transfer the tahini to a serving bowl, and garnish with fresh chopped parsley, if you wish. I think my aunt made these but the shell contained chickpeas rather than the grains you listed. THey were rather special. Have you ever seen such a recipe? Sadly I don't have it. Love your site! !